Ecologic Institute is proud to be ranked seventh worldwide among Top Environment Policy Think Tanks in the University of Pennsylvania's 2018 Global Think Tank Ranking. 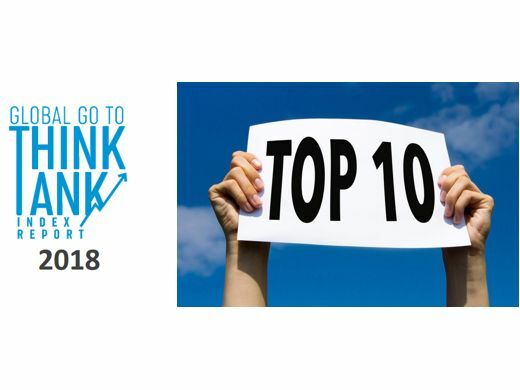 Since the introduction of the category "Environmental Think Tanks" in the ranking nine years ago, Ecologic Institute has continuously been ranked among the top ten. Another top ten-score was achieved in the category "Best Quality Assurance and Integrity Policies and Procedures". Ecologic Institute was ranked in seven categories overall. Prominent placings include "Top Think Tanks in Western Europe". Ecologic Institute moved up two ranks in this category, being now ranked 16 out of 141 think tanks. Other placings included the categories "Top Energy and Resource Policy Think Tanks", "Best Managed Think Tanks", "Think Tanks with the Most Significant Impact on Public Policy" and "Best Use of Media". "We are very honored by the fact that our commitment to impactful high-quality environmental research has been recognized around the world. It speaks to the reach and meaning of the work we are doing. The recognition over the past nine years strengthens our continued drive for excellence and impact – and the trends in the world show that high quality environmental research with policy impact is desperately needed." The top place in the Environment Policy category is held by the Potsdam Institute for Climate Impact Research. With Ecologic Institute and the Wuppertal Institute also among the top ten, Germany features as a stronghold for world class environmental think tanks. Think Tank of the Year 2018 was awarded once again to the Brookings Institution (USA). The rankings, compiled by the Think Tanks and Civil Societies Program (TTCSP) of the University of Pennsylvania, were officially launched on 31 January 2019. The results are based on a perception-based survey distributed to around 15 000 think tanks, journalists, policy makers, public and private donors and specialists, as well as a group of peers and experts. The TTCSP is based at the University of Pennsylvania and aims to increase the profile, capacity and performance of think tanks at the national, regional and global levels. The think tank ranking report is available for download.